Purchase orders and credits are tracked through the purchasing process using purchase statuses. 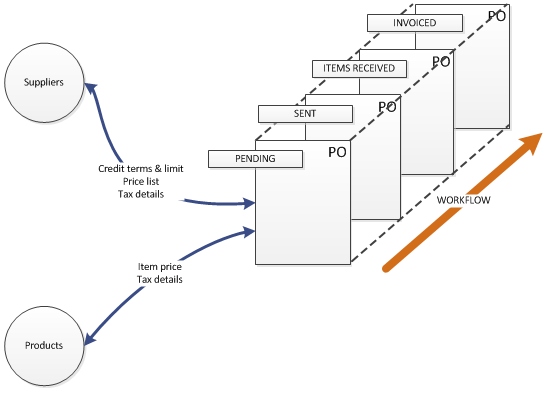 A pending purchase (not yet sent to the supplier) becomes an order which becomes an invoice, these are all statuses. You can create as many purchase order and credit statuses as you need in order to fit your own purchase processes. For example you may want a status for "sent to supplier" or "back order" or "on hold with supplier". Statuses should not be used to manage inventory, for example, whether inventory has been received. Brightpearl automatically tracks the status of inventory on orders. The status assigned to an order could be relevant for multiple stages of receiving inventory. Remind days can be assigned to statuses. This enables Brightpearl to provide notifications when the status hasn't been updated for a period of time. Assigning an email address to a status will prompt Brightpearl to send an email alert when a status is assigned.